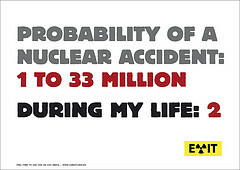 Actually, there have been three nuclear accidents in my life, but you get the point. I have never understood nuclear power. I don’t mean the actual physics behind it, but the rationale that is a clean, safe source of power. Ever since I was a child and heard about Three Mile Island in neighboring Pennsylvania, I’ve grown up in fear of reactor meltdowns (my uncle works at a nuclear power plant). During the cold war when my friends were afraid of nuclear war, I viewed cooling towers with anxiety. Shortly after the quake hit and news of possible problems with nuclear reactors trickled in, my neighbor said eat lots of seaweed. As my mother tried to assure me the nuclear problems were under control, I decided to do a little research to see how I could protect my family. Iodized table salt also contains iodine; iodized table salt contains enough iodine to keep most people healthy under normal conditions. However, table salt does not contain enough iodine to block radioactive iodine from getting into your thyroid gland. You should not use table salt as a substitute for KI…. I have ordered KI online, and today I stocked up on miso and seaweed. I still need to get some kelp to sprinkle on the dog food. Fortunately, my children love [amazon_link id=”B000HVX6NK” target=”_blank” container=”” container_class=”” ]seaweed snacks[/amazon_link]. I don’t think I am being paranoid, but I am being prepared. Seaweed and miso won’t hurt us, and even though radiation levels may be mild in the United States, I don’t want to take any chances. It will be months before radiation stops leaking. Thankfully, the amount of radioactive emissions that will reach us will not be nearly as great as that of the poor people of Japan. They have my greatest empathy. We can’t sit on our laurels and pretend this won’t happen to us. We have nuclear power plants along the ring of fire, and history has proven you don’t need an 8.9 earthquake to have a meltdown. It’s time to end nuclear power in favor of truly green energy. I feel like I am being prepared, and yes, we are exposed to radiation daily. Eating seaweed is a great natural defense for this exposure, and it will not harm you but only benefit you to eat sea veggies. It’s important to eat before x-rays, for example. Any amount of extra radiation is too much in my opinion for children. If I can feed them healthy food to combat the risks, I don’t feel that is overreacting. Keeping potassium iodide on hand is simply smart when our country is covered in nuclear sites. Did you know that every post office has some on hand? Remember the anthrax scare? The USPS sent it to all facilities then. Blessings on you and your family….